The adjustable leg stool allows an assortment of heights to accommodate everyone, and can be tilted to relieve strain on your lower back. The tilt feature also puts you over your work to help you while centering on the wheel. 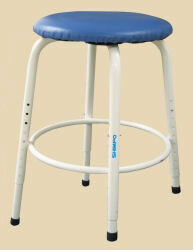 The stool is finished attractively with a white frame and blue seat. 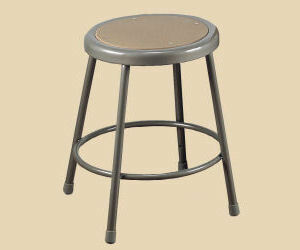 The adjustable leg stool not only serves the potter but will also comfortably fill the needs of the painter and sculptor. 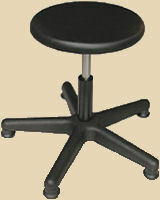 This model has a rugged, contoured seat that provides lower back support. Madefrom molded plastic, firm cushion, durable in severe use conditions, and easy to clean. Air cylinder finger touch height adjustment extends from 6 to 21 inches. Five leg base with glides for stability in all directions. This model has a thin, firm, durable cushion. Manual spindle adjusts from 18 to 21-1/2 inches. Five leg base with glides for stability in all directions.